We stayed at this hotel in January 2016 on our way home from Florida. Florence, SC is a good distance for a stop between Florida and North Carolina—a little more than halfway, making the next day's drive easier for those who don't want to drive straight through. This Comfort Suites is five years old but it looks new. 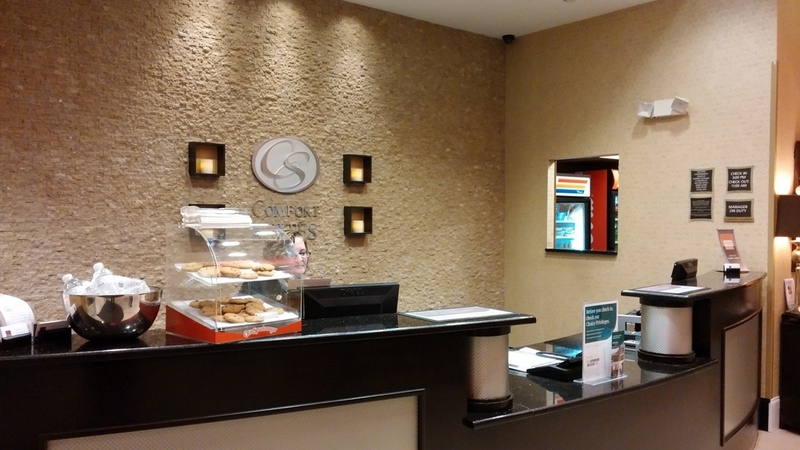 We were very impressed with its cleanliness, comfortable atmosphere, and attractive interior (including a peaceful wall waterfall), not to mention the good cookies at the front desk. This hotel uses RFID key cards, so just touch them to the lock to open the room. Our king room bed was exceptionally comfortable with high quality bedding. 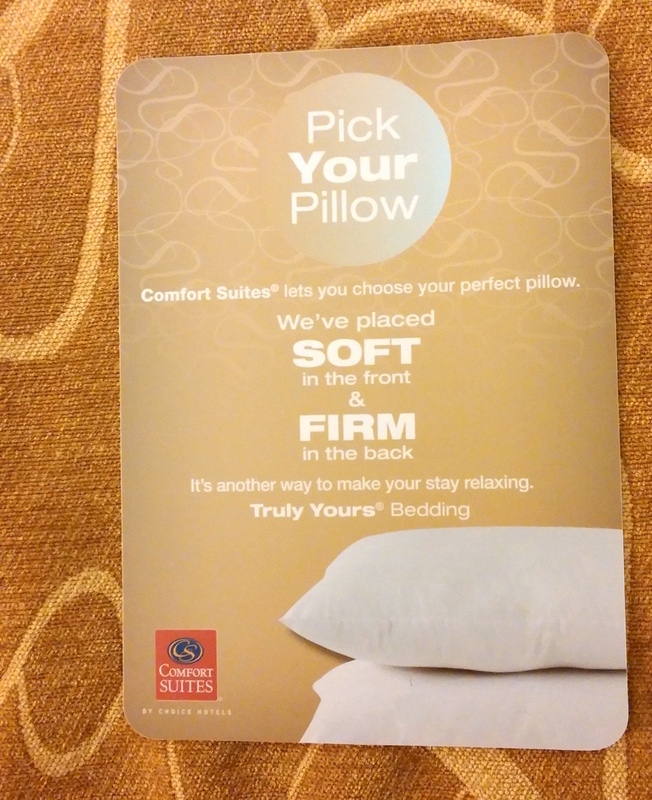 It even came with both firm and soft pillows (and a card to let you know), a very nice touch. There didn't seem to be much differentiation between firm and soft versions, but we slept very comfortably. 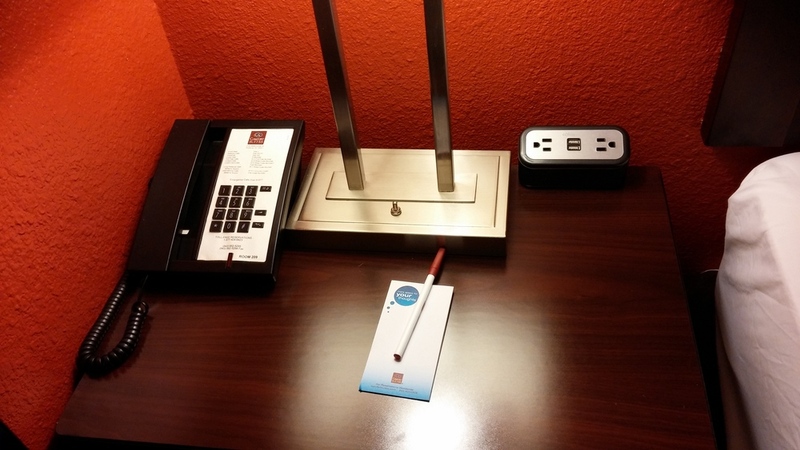 Both the desk and one bed side table came with a USB charging station (two USB ports and three AC outlets) plus, on the desk, a lamp with an AC plug in its base. 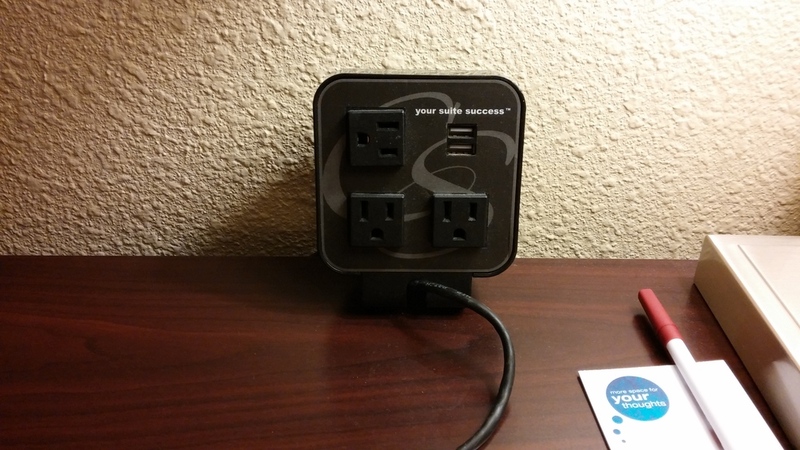 The other side of the bed did not have a convenient power outlet. The large desk comes with a roll-out typing station and a comfortable office chair. The room included a small fridge, a microwave, and a sitting area with a nice couch and coffee table. The bathroom has a large counter space for laying out toiletries and the shower includes a convenient slat frame metal shelf for drying swim suits. The room door has a sturdy magnetized night latch for extra security. We enjoyed a small but nice indoor heated pool that is actually deep enough (5 feet) to swim comfortably. In the photos you'll also see a small but good quality fitness center. Breakfast was wonderful. There is a very large and comfortable seating area and a wide variety of tasty breakfast foods. Even the Belgian waffle maker comes with a choice—regular waffle mix or a cinnamon variety. 1. The room heating unit made a buzzing sound; probably a maintenance issue. 2. The desk charging station, when charging two phones at once, stopped charging one of the phones. 3. The room thermostat must be off; even set down to 66 degrees, the room temp was actually about 74 degrees. We were very impressed with this hotel and intend to look for more Comfort Suites in the future if this one is representative of the chain. Stop at the state border rest area to get a good discount coupon.